I never tire of seeing photos of Len with his friends and family. Here he is in a visit with Henry and Charlotte Voisey, c. 1980. 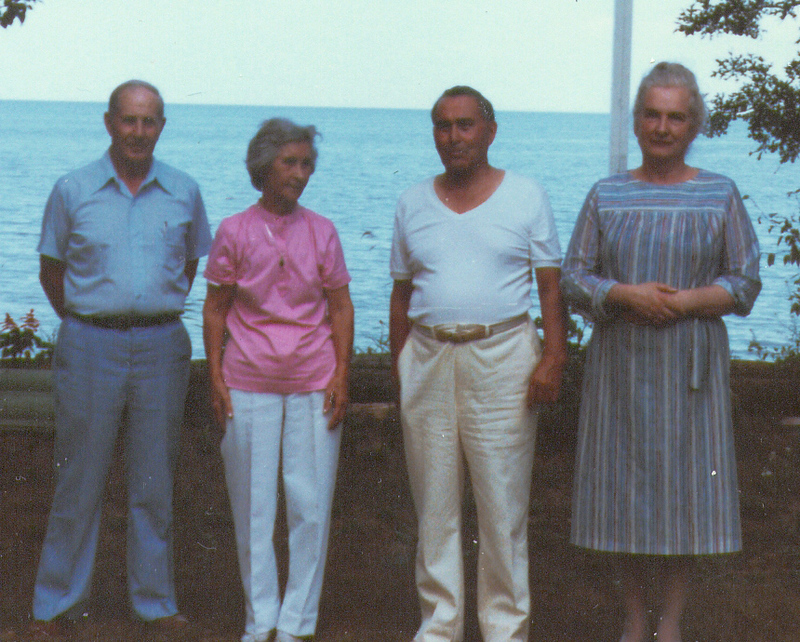 In the first photo, from the left, Len Budgell, Charlotte, Henry and their daughter Mary Voisey. The second is Len at Henry Voisey’s 90th birthday party. When I met Leonard Budgell almost by accident in 1978, he was 25 years older than me, about the age of my father, yet we became the best of friends. 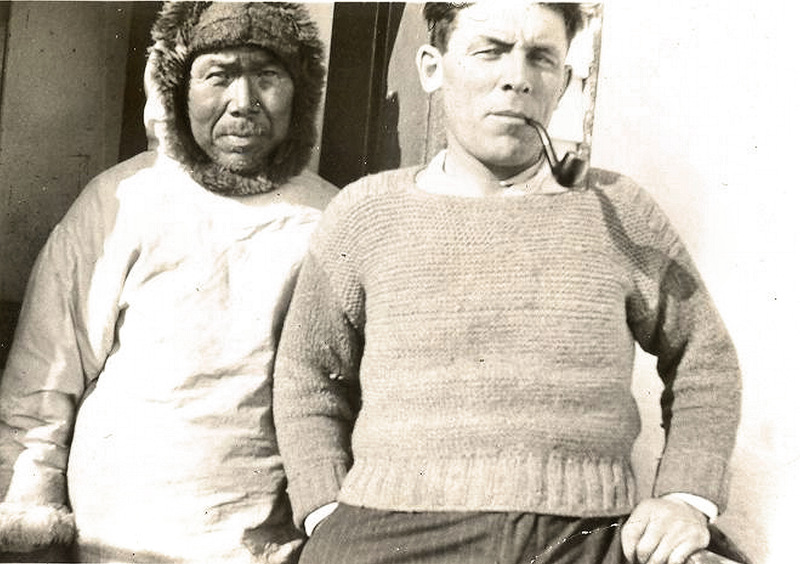 Len was closest with friends like with Henry Voisey and Charlotte, both of whom were from Labrador, and who were, in Len’s own words, of ‘Eskimo’ descent. Henry was an HBC man, and a radio operator, as Len was. You will love their faces, he said. He’s short and solid and square, and she’s small and birdlike and so warm. There were so many things Len and I could talk about with each other and with no one else. We were safe with each other, and there was trust. There are 17 hours of oral history on tapes in the Hudson’s Bay Archives, orchestrated by Jocelyn McKillop, but the hundreds of hours we spent over meals, tea, walks in Oak Hammock Marsh, or Bird’s Hill Park, at MacDonald’s while we watched his grandchildren play in the “Play section’ are mostly lost. I visited him in Moosonee in the 1990s where, after his Hudson’s Bay Post Manager career, he managed Federated Shipping for The Hudson’s Bay Company. That company shipped equipment, food, and basic supplies to communities on James Bay. He visited me when he came to Oshawa from Winnipeg to see his daughter Kathy and his grandchildren. We met in Toronto, Kingston, Ottawa, Sharbot Lake…and during these visits we talked, with satisfying bouts of being quiet together, listening to coyotes howl, watching for bear prints on the beach. 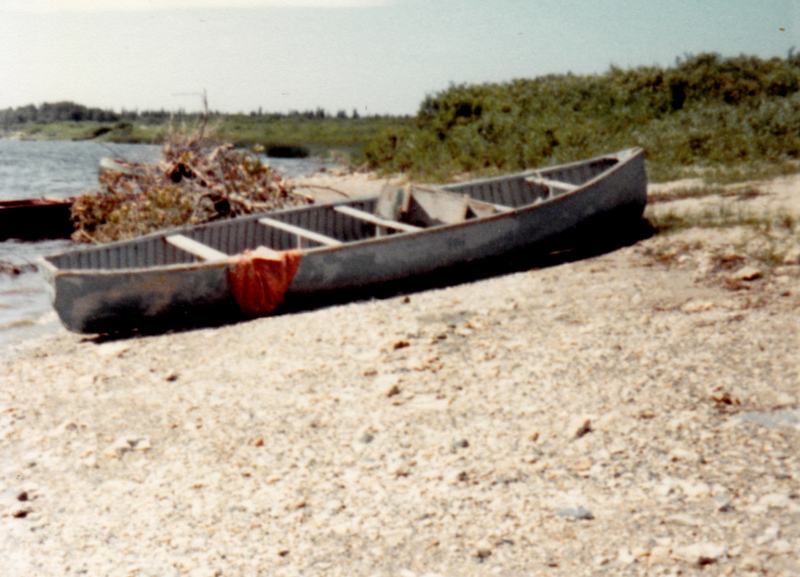 I especially loved our time in Moosonee, I reveled in the the clean fresh air, in our canoe trips on the river, flights over James Bay; I was spoiled by Asheurias, the wonderful cook for the people who worked with Len. Ash would say, Eat it all up, maid, and present me with enough Newfoundland-style cooking to feed the whole town. And Len and I talked into the small hours. I wish I had some physical record of more of his stories: the one about a criminal wearing a suit, and carrying only a suitcase who’d come through Hebron and stayed with him briefly; a tale of how the crew of the Nascopie once stole a goose he’d roasted at Hebron that showed another side of his usual peaceful nature; of the Inuit man whose wife needed delicate care that only Len could provide; his own story of his courting of Muriel, their long love and the bringing up of their children. And many stories of Hebron, one of the places he hoped to show me one day. (I got there in 2005, five years after he had died.) One thing we never talked about was our own dying: I was unprepared for his. Several times I nearly died while I was in Vanuatu, and there were many times he could have died on his postings. I never told him of my encounters with the Grim Reaper, nor did he regale me with his. If he mentioned, as he did in a letter quoted in Arctic Twilight, some glitch with his heart, it was a humorous recounting, after the fact. If he had outraced an avalanche, that was merely a lucky victory over the bleak fellow in the hoodie. Our own demise wasn’t a subject to be avoided; it just didn’t seem that important. Neither of us was afraid of it, neither attached any importance to philosophizing about what happens after death. He worried more about suffering, but it was the suffering of others he lamented. He worried more about what was happening to all those in small communities in Labrador, the conditions they were living under, the alcoholism, the young peoples’ suicides. In Ottawa in the mid nineties, we were visiting a friend of his, a brilliant and well-known elderly anthropologist, to hear his views on an early version of Arctic Twilight. Afterwards we went to what was still called The Museum of Civilization, in Hull. Cardinal’s curving building meant to him the snowy Mealy Mountains in Labrador where he had often hunted. Some of these experiences are in Arctic Twilight, but I remember particularly two things about that afternoon. 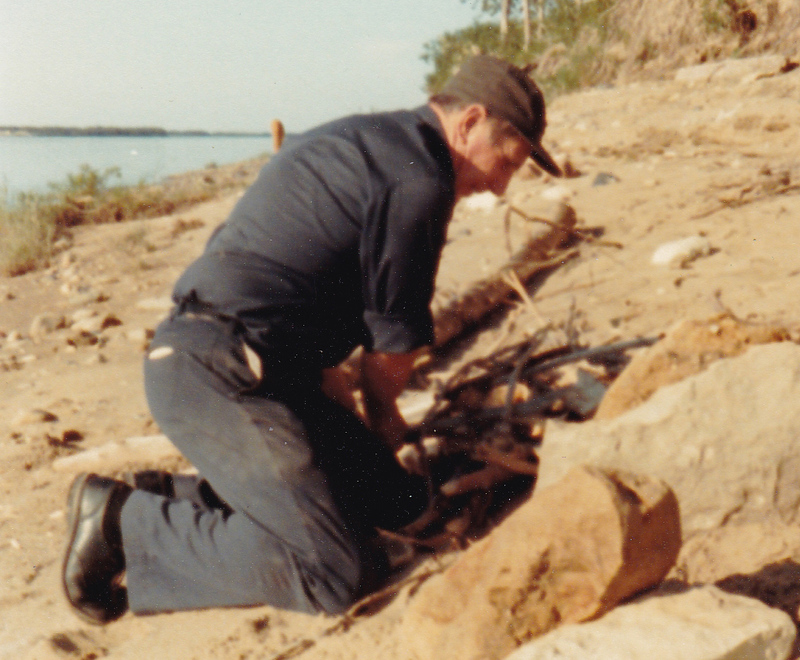 The first is that after we took in the totem poles and the exhibit of the Eastern Aboriginal culture, after he spent a long time with a York boat that brought people and goods to places like Fort Garry near Winnipeg, he seemed tired. It was the first time I had ever seen him tired. He was about eighty years old, yet it took me by surprise. In my mind he had always been energy personified, a person who got up every morning at 5:30 and did useful things until he went to bed. The useful things included writing letters to friends, to anyone who wrote to him. He wrote stories, sending several to Them Days Magazine in Goose Bay, Labrador, and he wrote letters to the editors of the Whig Standard newspaper and The Beaver magazine to comment on mistakes that ‘those idiots’ had published without sufficient research. His home in St. Boniface was spotless and cared for; after Muriel became ill, he took on the responsibilities for all aspects of taking care of the house. He had a wonderful garden with incredible produce, and he planted, weeded, and harvested produce from the fertile soil of a younger daughter’s garden on a farm outside Winnipeg, looked after his grandchildren as often as he could. 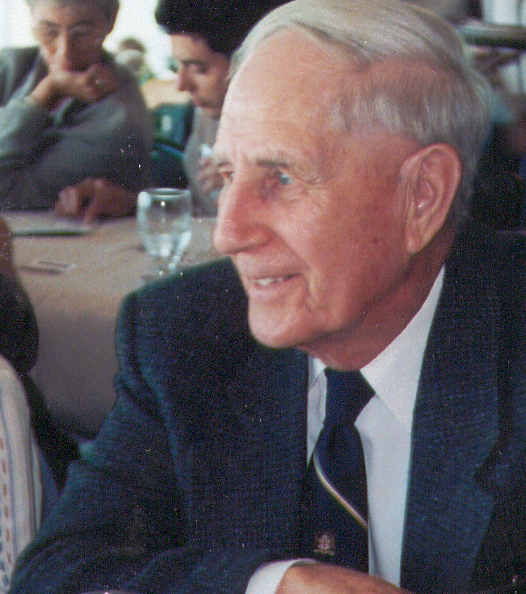 He had lunch with his old-timer friends from The Hudson’s Bay Company, and kept an office at the Company’s main headquarters for years after his retirement. He visited with his Mennonite and Ukrainian friends. Muriel had been diagnosed with Alzheimer’s and was often in pain from arthritis; there were hospital visits, home visits; he himself had some heart problems but despite tests and drop-ins at the cardiologist office, he kept on going. He liked a clean house so he vacuumed and washed floors and did laundry. He made jam, preserved fruit. Wild cranberries meant dozens of jars of jelly, and he helped as much as possible in the kitchen, especially on clean-up. His driveways were shoveled before full daylight, and he helped with his neighbours’ shoveling too. 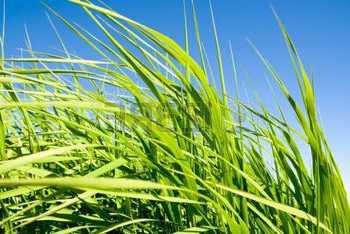 In spring, he’d be off to the Marsh to see spring happen there. But at the museum he was a little slower than usual, happy to sit with a coffee. He did, though, want to see the Arctic exhibit. This is the other important thing I remember from that day. When we entered the exhibit, there was a long wall with life-sized photographs of some Inuit, smiling at the camera, as if in welcome. Well there’s ( an Inuit name)…!, Len said, his face brightening. And there’s his brother, and his father, giving their Inuktitut names. He named several others on the wall, and since my memory is not anywhere near what his was, I don’t remember the names or what else he told me about these friends of his that graced the Arctic Exhibit. I wasn’t surprised that he knew their names, or these people. names down, or suggest we get the Museum to put their names with the photos. Probably only Len knew who these men were, and it was a bad slip-up on my part not to have done so. Perhaps it was part of policy, or just habit, that names of native peoples were not recorded. I never could find out the name of a native person in a photograph of Len’s father when he was a young Servant of the Bay at Davis Inlet, although the native figured as large as George Budgell did in the photo. 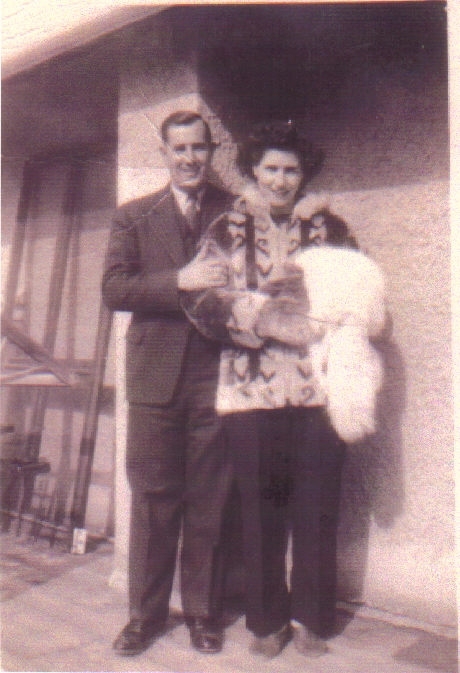 Since Len himself was a very small boy at the time of the photo, he didn’t know either. This is the photo of George Budgell, Len’s father, taken around 1927. 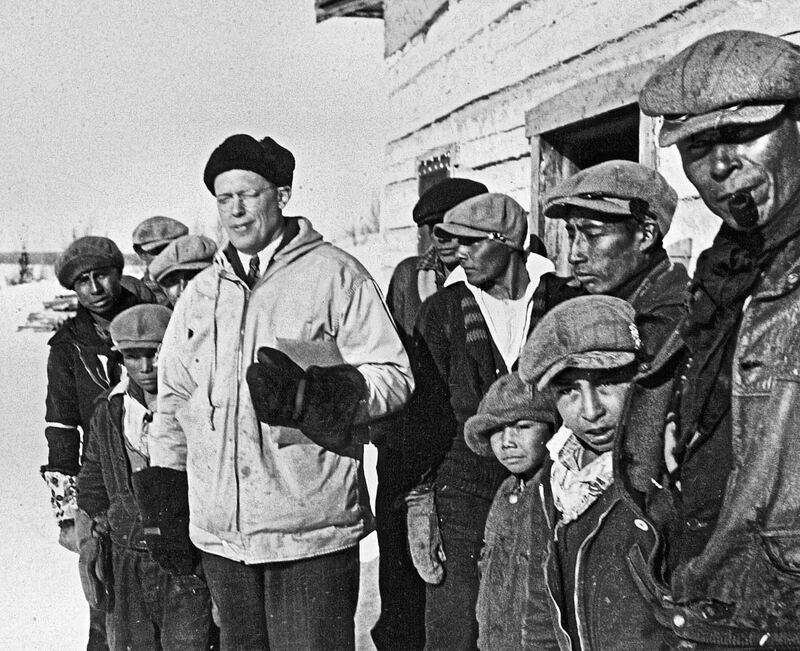 Afterwards I saw that in so many archive photos, whether in the National Library, The Manitoba or The Hudson’s Bay Archives, even the Labrador Archives in The Rooms in St. John’s, only the names of the white people were noted. Here is his great Hudson’s Bay friend, W.E.Brown, whose story runs through Arctic Twilight. (Brown had been a Mountie in the North before starting his career with The Bay.) Len never saw this image, but he would say that ‘Buster’ Brown would have known the names of most of the people with him here. I never saw Len with a camera, though he didn’t mind being photographed. He didn’t need an image to help him remember, and perhaps he felt that by isolating one moment, he would not remember other details associated with it. Leonard remembered all the names of those he had dealings with, especially people like Millik whom he respected and cared about, making no distinction as to whether they were native. In fact, a person interested him more if he or she were native. Every single one was an important person, no one more important than the next. There are some who would have wished he hadn’t remembered their names, for he never forgot those who acted unethically, especially if they were Hudson’s Bay employees, historians, writers or publishers who had not done their research in the history of, or the vessels owned by, the Hudson’s Bay Company. Once when he was visiting me, having arrived in Kingston by train from Toronto, my car broke down and a tow truck called. He had to be lifted by the driver into its cab for the ride to the garage, and in my home, he wasn’t jumping up to make tea or suggesting that we walk in the woods. When on his return trip, a porter who saw he had difficulty getting into the train suggested he have a wheelchair waiting in Toronto, he shook his head. Of course he wouldn’t need one, yet in his next phone call he admitted that he wished he had said yes to that plan, that the station had seemed very big to walk across that evening. But he hadn’t talked about his pain; it was as if he figured if he didn’t mention it, it didn’t exist. Early December of 2000, I got a phone call from Len’s youngest daughter saying that he’d been operated on for a hip replacement, but that he’d gone into a coma. Of course, he hadn’t let me know that he was going to have the procedure. He wouldn’t have me worry. He’d let me know once it was all over. I asked if she would go in and tell him that Claudia says she loves you. The next day, a second call. Her father had not survived. I did as you asked, she said….We’re so glad that you were in his life.